Anyone who has worked in medicine for a long time well understands the power of the statement coming from an experienced person: “This kid looks sick.” That person could be a physician or nurse. Years of experience does tend to give one a sort of sixth sense for when to worry something serious is going on that just hasn’t shown itself fully yet. Seasoned parents can often provide the same perspective. A fascinating recent article pertaining to this appeared in Critical Care Medicine, the journal of the Society of Critical Care Medicine, entitled “What faces reveal: a novel method to identify patients at risk of deterioration using facial expressions.” It suggests an empiric perspective for studying just how this phenomenon may work. It’s not about children, but the findings could easily apply to pediatric patients. The authors include experts in empirical evaluation of facial expressions, broken down into something called “action units.” This is a scientific field I have to say I had no idea even existed. They used video recordings of 34 patients identified by nursing as potentially, but not yet, deteriorating clinically. The patients were then followed in time to identify those who ended up in intensive care for deterioration and what their faces were doing just before that. They also used a standard measure in the UK for deterioration termed the National Early Warning Score. This is based on objective measures such as heart rate, respiratory rate, level of consciousness, and other things that can be measured. The video recordings were analyzed by observers trained in this sort of thing but who were blinded to who deteriorated and who didn’t to see if subtle facial signs predicted this. You can look at the paper for the minute details, but some of the most useful distinguishing features were overall head position and what the person was doing with their eyes. I sure have seen that aspect in action. For example, a very useful observation when evaluating a child with respiratory distress is to look into their eyes: Are they paying attention to anything besides breathing? Can you distract them? Painters have been capturing face expressions since antiquity. 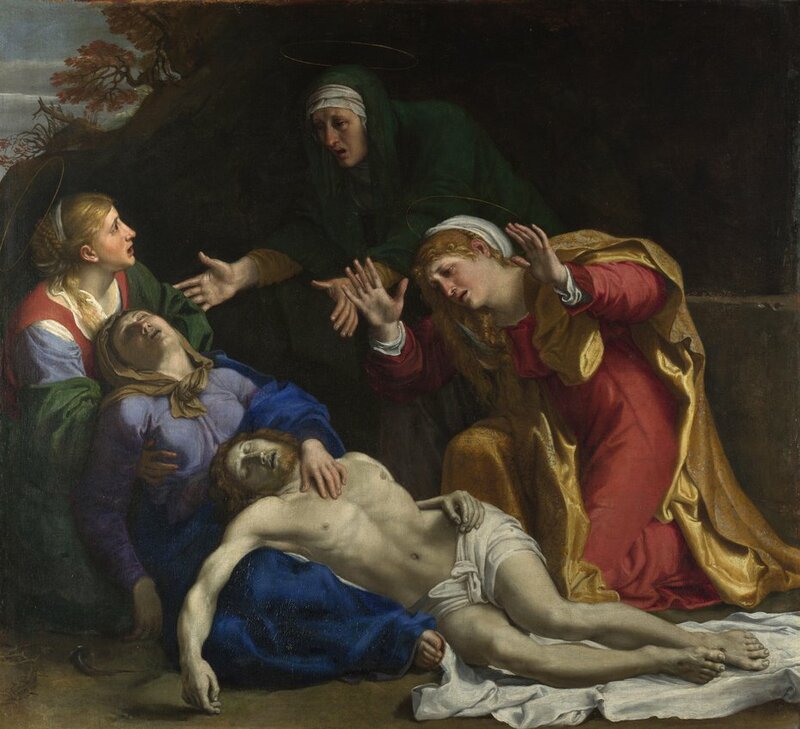 The painting “The Dead Christ Mourned” by Annibale Carracci (1560-1609) is striking in its composition. Carracci showed the same facial expression in the dead Christ and Madonna, clearly displaying . . . AU 15 (lip corner depression), AU 43 (eye closure), AU 51 (lateral position of head), and AU 25 (lips parted). The authors think their methods might be incorporated into standard evaluation systems. Maybe. What I think is their work validates what we have known for years. When experienced clinicians look at a patient, they unconsciously incorporate into their assessment what they have gleaned after years of looking at sick people and what happens to them. Here’s another interesting example. Separating the very ill and liable to deteriorate from the not-so-sick is a perennial challenge in the emergency department setting, particularly in pre-verbal children. Untold numbers of research studies have tried to come up with something, anything, perhaps some blood test, that could help in this sifting process. Not surprisingly, it turns out the most useful measure for children is for the most experienced person in the room to say: “That kid looks sick.” When you hear that, believe it. Anyway, I find this work fascinating as an example of how cross-disciplinary research can work, and I applaud whichever author first thought of it. I believe the article is behind a paywall; if anyone can’t get access to it and wants a copy, let me know via the contact form on my homepage.